A behind-the-scenes look at how an exhibition is curated. Jen Shaw, Exhibitions Officer for the Special Collections Centre gives a glimpse into how an exhibition comes about: from deciding on a subject or theme, through to the selection of objects, and finally to the week of installation. Fun, fascinating and, at times, frantic! 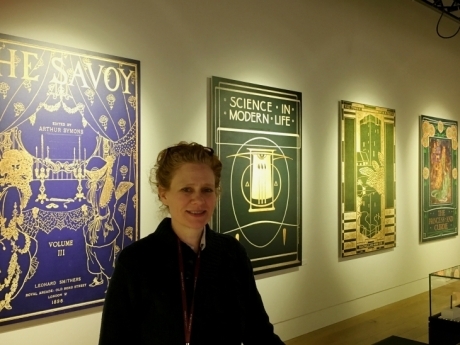 Jen Shaw is the Exhibitions Officer for the Special Collections at the University of Aberdeen. After studying History of Art at St Andrews University, she went on to complete an MA in Museum & Gallery Studies at Manchester University. Her first job was as the Touring Exhibitions Officer in Dumfries. She followed this post with a curatorial position as Keeper of Art at Bolton Museum & Art Gallery and Arts Development work in Cheshire. Following 5 years living in the USA where she was the Gallery Coordinator for two contemporary spaces in Chicago, she returned to the UK and took up the post in Aberdeen in 2015. This talk will draw on Jen’s 20 years curating exhibitions in museums, galleries and other spaces on a range of subjects from to Japanese netsuke, to contemporary ceramics, to Charles Dickens. She will be looking at the processes involved in getting the idea for an exhibition from the drawing board into a finished design in the gallery and showing examples of different types of exhibitions and their particular challenges. A light-hearted and entertaining look behind the scenes of exhibitions. This event is free and open to all, refreshments will be provided. Please note the Friends AGM will take place at 6.00pm, followed by the talk Behind the Scenes of an Exhibition at 6.30pm.